A senior European Commission official has poured cold water on claims that a shale gas boom in Europe would result in de-facto low gas prices. Speaking the day before the European Commission unveiled the preliminary results of a public consultation on the issue, Robin Miege, director of strategy at the European Commission’s DG Environment, said that while shale gas was a "game-changer" in the United States, bringing energy prices to their lowest level in a decade, conditions in Europe were rather different and would not necessarily be replicated. With Europe's energy prices over twice the US levels, unconventional fossil fuels are climbing higher up the European policy agenda. The results of the public consultation, which were presented by the Commission's environment directorate on 7 June, showed that over half of the respondents were favourable to the development of shale gas in Europe. The interest group Shale Gas Europe said on Twitter that the findings represented “a balanced outcome regarding [the] development of unconventionals." Responses from Poland, which hopes to develop unconventional hydrocarbons to lessen dependency on Russian gas imports, represented over half of the total (11,714 out of 22,122 individuals) and overall were very supportive of shale gas. According to Antoine Simon, extractive industries campaigner at Friends of the Earth Europe, this represented a “biased overview of the European feeling about shale gas”. He said that when the results of the consultation were weighted by nationality, about 60% of respondents were against the development of shale gas on the continent. “Even taking into account that most of the respondents were from Poland, it still wasn’t extremely favourable”, said Simon. The vast majority of respondents were private individuals, though other stakeholders, such as businesses, NGOs, industry associations and governmental bodies also took part. “A large majority of respondents agree on the lack of adequate legislation, the need for public information and the lack of public acceptance of unconventional fossil fuels”, according to the presentation of the consultation. Miege, who was speaking at a conference on air quality in Brussels on 6 June, told EURACTIV that “effects of a possible future domestic shale gas production on energy prices in the EU still need to be ascertained." He added that any fall in prices would “probably be much less than was initially foreseen." According to the senior EU official, the possible benefits of European shale gas production would more likely come in the form of diversification of the EU's energy mix, and in more energy security, or in the potential to re-negotiate with the main gas suppliers, but “the effect on prices is not necessarily going to be major". A majority of respondents to the public consultation agreed that main potential benefits of shale gas were avoiding increasing the EU’s energy import dependency and strengthening the EU’s negotiating position with external suppliers. Over 50% of those questioned also believed that shale gas would make energy cheaper for consumers. However, numerous analyses of the potential impacts are more cautious. Unconventional gas production costs in Europe are likely to be two times higher than in the US, according to a study by the International Energy Agency. There are important geological and geographical differences between the US and Europe, as well as much a higher population density, and a less developed gas infrastructure in some countries. As EURACTIV has previously reported, there are also questions regarding the sustainability of the US's low gas prices. Despite this, shale gas supporters in the United Kingdom, where a moratorium on drilling has been lifted, argue that the exploitation of unconventional reserves will bring down energy bills. “Significant exploitation of British shale gas across the continent could reduce our exposure to hydrocarbon price volatility on the world markets. That could contribute to the stabilisation of British energy costs – good for homes and for businesses – at the very least”, writes Christopher Pincher, an MP from the governing Conservative Party in a party blog. Miege also highlighted uncertainties regarding the amount of recoverable shale gas reserves in Europe, noting that in some cases initially optimistic estimates have had to be revised downwards. “In a most optimistic case, European shale gas can only compensate for declines in domestic conventional gas, it won’t make Europe self-sufficient by itself. Further exploration would be needed to determine the level of reserves. That is met with public opposition in some countries, so we find ourselves in a catch-22 situation”, Miege said. Companies hoping to benefit from shale gas exploration and production licenses continue to revise reserve estimates up. The latest to do so is the UK’s IGas, which said that there may be up to 170 trillion cubic feet (tcf) of gas within the limits of its exploration licenses in Cheshire, northern England. This is twenty times higher than the firm’s previous estimate of 9 tcf. “Our estimates for our area alone could mean that the UK would not have to import gas for a period of 10 to 15 years”, said IGas chief executive Andrew Austin in a statement on 3 June. The amount of gas that is extractable will become clearer when the company carries out further drilling later this year. Shale gas is a so-called "unconventional" fossil fuel that is found within natural fissures and fractures underground. Until recently, no method of safely transporting it to the surface had existed. 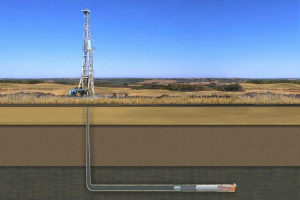 It is mined via hydraulic fracturing, or "fracking", the process of breaking apart layers of shale by pumping liquids and a number of chemical additives under high pressure thereby releasing trapped gas reserves. To proponents, shale gas represents an untapped and welcome alternative energy source to traditional fossil fuels. At the moment the continent depends on gas imported from Russia, and disputes between that country and Ukraine have disrupted winter supplies in recent years. In the US, shale gas already accounts for 16% of the world's largest economy natural gas production and some analysts predict that could rise to 50% within 20 years. 2013: European Commission to unveil results of public consultation on unconventional fossil fuels, including shale gas, and decide on next regulatory steps. Energy Policy Forum: Shale and Wall Street - Was the decline in natural gas prices orchestrated? And what about the ENVIRONMENTAL COST of shale gas? Bringing energy prices down with short-term boosts is exactly the opposite from what we need. Again ‘free competition’ is driver and legitimzer. Like Cameron was quoted saying yesterday “we’ve got to roll our sleeves up and compete”. Policy strategy reminds us of pub-brawls? I’m sorry but there is a major misquote here by the journalist that needs to be corrected IMMEDIATELY. This statement is inaccurate as it interprets the total results rather than the weighted response per population. The weighted response is a more accurate measure of public opinion given the high number of responses from one country, in this case Poland. When you look at the results of the weighted response you will see (on slide 27 of the results) that, in fact, 64% of respondents are oppposed to any development in Europe at all. Quite the opposite of what the journalist has stated above. One has to wonder who we can trust when an ‘error’ on something as important as this is published! Slide 27 clearly shows that 64% of respondents are against fracking and would prefer an outright ban! With 64% of respondents against any unconventional fossil fuel development at all, this calls into question the Commission’s approach to developing guidelines. The majority of respondents – agan when the weighted response is taken into account – are, in fact, in favour of a specific directive on unconventional fossil fuels, yet the Commission has decided instead to develop guidelines. Who does the Commission listen to? Industry or citizens? The frackers could not leave the survey alone, but had to skew the results by ‘encouraging’ their own employees to respond. This should tell you that they know that public opinion is swinging against them. If you have a strong case, why resort to trickery? If you have nothing to hide, why hide it? The industry always reverts to dirty tricks and lies because they know better than their opponents just how flawed the whole fracking process is. They get accurate returns and reports of all their operations and work very hard to keep them secret, but they read them before they bury them. Balanced reporting not misquoting. When writing one thing has to come before another and in fact it was the Commission that presented the results overall, with the Polish skew included, first. Theo Moore, I’m afraid you didn’t see the original article which didn’t include that quote from Antoine Simon. That quote was only added yesterday evening after several people wrote to the editor complaining about the statement implying over half of respondents are in favour of shale gas, which is in fact an incorrect statement. The euractiv journalist didn’t even realise that the weighted response is the most accurate measure of public opinion. But we shouldn’t expect too much from journalists nowadays I suppose. Even the Commission made it very clear at its presentation last Friday that two thirds of all respondents when weighted by country are opposed to shale gas.